A lively, if clunky, look at the education system. This new play by Tamsin Oglesby has the education system square in its sights. Several interwoven threads are presented to us: English teacher Mr Crane (Rob Brydon) struggles heroically with his class of students, an education committee tries to solve the problems of inequality, and elsewhere a group of primary school mums wait anxiously to find out which high school their children have been accepted into. 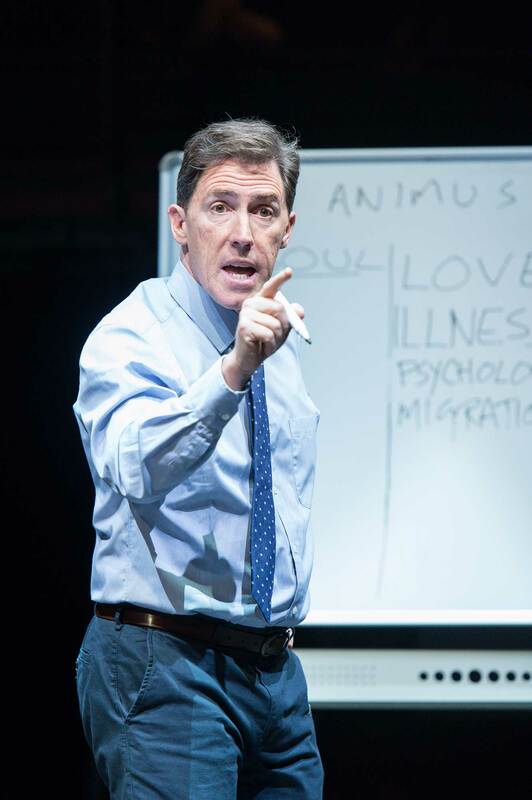 There’s laughs to be had – the committee room descends into biscuit-throwing mayhem, the mums squabble viciously and Rob Brydon gets some laughs for his world-weary interactions with his invisible class. However, the whole piece feels so biased towards Oglesby’s simple point – that the education system is poorly managed and unfair – that no character is ever developed enough to be believable. Often she falls back on simple caricature: the committee scenes are dominated by arguments between a socialist Scotsman and the posh boy who used to go to Eton. This feels less like dialogue and more like an exposition of the author’s arguments, with some cheap gags thrown in for good measure. While I agree wholeheartedly with the message of the play, the lack of nuance or depth in the political discussion meant these scenes never reached their full potential. The other recurring scene – the mothers at the school gate waiting on their children’s acceptance letters – is something Oglesby obviously has first-hand experience with. The frustration of ordinary people struggling with the bureaucracy of an invisible and seemingly unfair system rings true. However the characters suffer from being too broadly drawn – so much so that it’s hard to genuinely relate to any of them. The scenes that bookend the play – two Oxford dons discussing the interview of a precociously bright Pakistani student – are even worse. This caricature of snobbish Oxford elitism wouldn’t have been out of place in a pantomime. I’m sure that elitism does still exist and I’m sure the Oxford selection system could use improvement, but this play feels so biased in it’s portrayal that it’s hard at times to take it seriously. The Pakistani student, Alia, is the only sympathetic character in this show, and her relationship with the likeable Mr Crane is perhaps the only relationship that is drawn with any skill. The scene in which he hears she has been accepted to Oxford is genuinely moving. Yes, the English system is biased, and this play will certainly get people talking about the problems it faces. Hopefully though, the discussions outside the theatre will be more nuanced than those on stage.